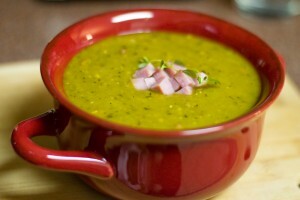 Step into Spring with Split Pea Soup! Split Pea Soup is a favorite in the Geek household! Easy to make, great to freeze and tasty, it never seems to last long. 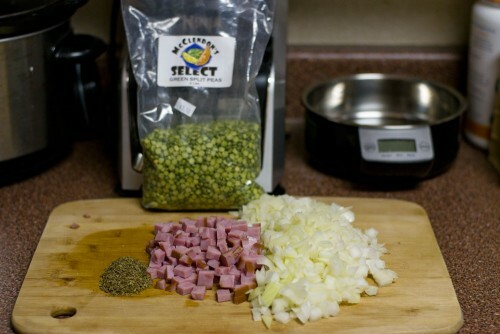 It always seemed like split pea soup was a treat growing up. My mom used to use leftover Christmas or Easter ham to flavor her soup. While you don’t need to add ham, it does add great flavor and salt. Pea soup has been eaten since antiquity; it is mentioned in Aristophanes‘ The Birds, and according to one source “the Greeks and Romans were cultivating this legume about 500 to 400 BC. Pea soup was mentioned in the well-known nursery rhyme, Pease Porridge Hot, Pease Porridge Cold which first appeared in 1765. 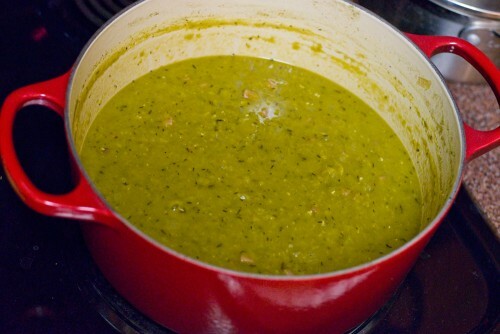 In the United States, “pea soup” without qualification usually means a perfectly smooth puree. “Split Pea Soup” is a slightly thinner soup with visible peas, pieces of ham or other pork, and vegetables (most commonly carrots) and is usually made from dried, green split peas. 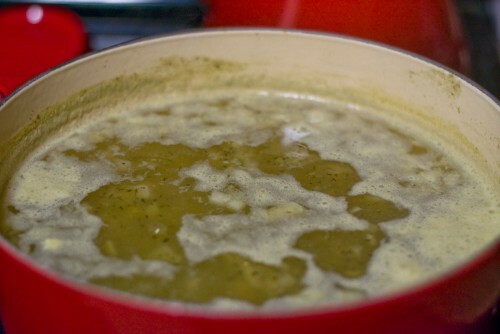 The most important thing to keep in mind for a good pea soup is to be patient. Some of our best batches have taken hours. We hope you enjoy one of our favorite recipes while the weather still allows for it (at least in some areas)! We’d love to know what soups you love, leave us a comment with your favorite soup! Place in 5 quart Dutch Oven filled about 2/3 full with water. 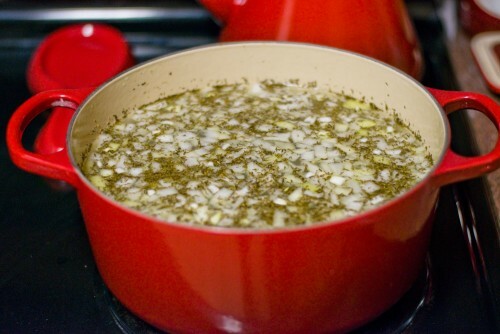 Let simmer until the peas have no definition and onions have dissolved. Cook time will depend on your stove and how you prefer your soup. We like ours to be thick but you can thin your soup out by adding a 1/2 cup of water until your desired thickness is reached. Mmmm! 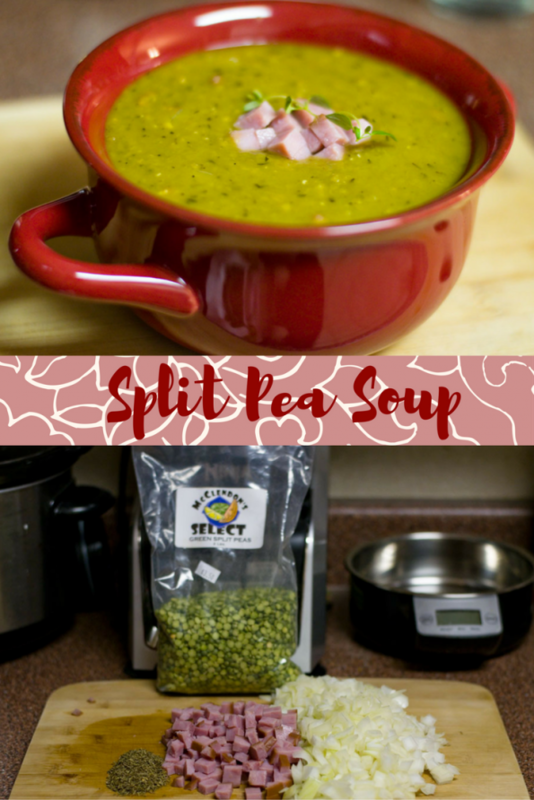 We love split pea soup! I usually add a few carrots and some celery. Your recipe is so simple and easy to follow 🙂 Thanks for sharing! !